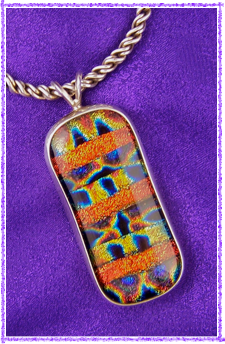 Artistic hand crafted glass work dates back nearly 4000 years. 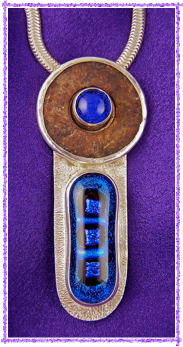 Examples of Ancient Egyptian & Roman handmade fused glass can be found in museums around the world. Combining this ancient fine craft with state of the art technology, Hayden Brook Studios makes exquisite, finely crafted jewelry at affordable prices. 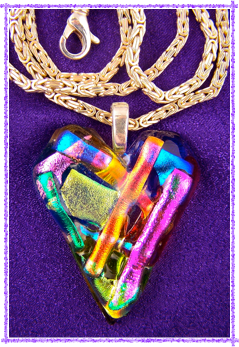 At Hayden Brook Studios, we work with dichroic glass (di-chroic means two colored) . This type of glass transmits light in one wavelength, and reflects lights in two other wavelengths. It is coated with electronically excited metallic particles in a vacuum chamber. We start with large sheets of glass which we cut into small pieces. These pieces are specially arranged & melted together in a kiln to form accent pieces for our jewelry. The glass melts at approximately 1800 degrees Fahrenheit. 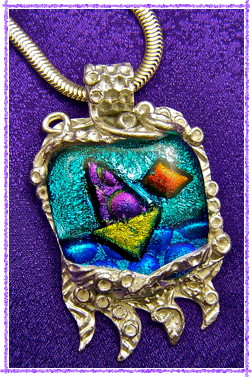 We set some of our most beautiful pieces of dichroic fused glass in Sterling silver. Laurie Hayden & her husband/ volunteer partner, Brook Bergey draw their inspiration from experiences living, & studying art in: California, Nevada, & Peace Corps (Africa & Jamaica), as well as traveling in Europe & North America. They have recently relocated from Pennsylvania to Florida. Check in from time to time to find out what is going on in Brook’s realm. and SHOP: In Stores Near YOU~!